But what if you want fresh bread day to day? 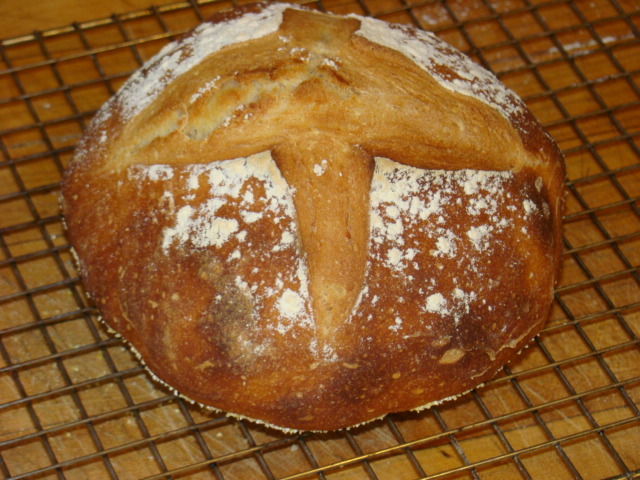 Well, thanks to the book Artisan Bread in Five Minutes a Day: The Discovery That Revolutionizes Home Baking you can. I have been messing with the basic recipe for about a month. It makes a great loaf for dinner after work, rolls, even pizza! In fact, the pizza in the header of my blog comes from this recipe. 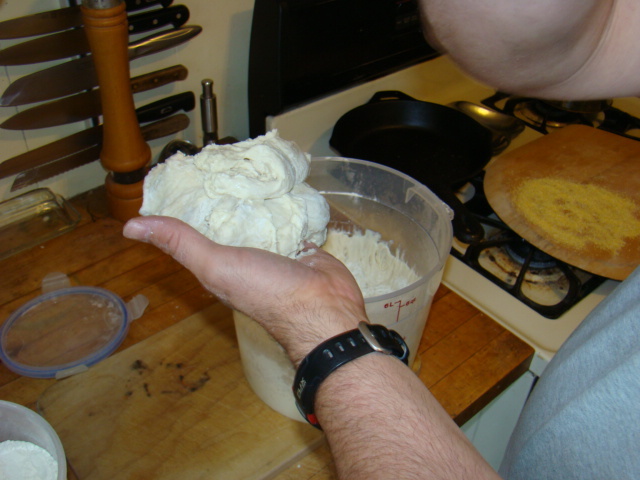 It is very straightforward and simple – plus, once you stir the dough – you can have bread from the batch for up to two weeks. The longer it goes in the fridge (yes, the fridge!) 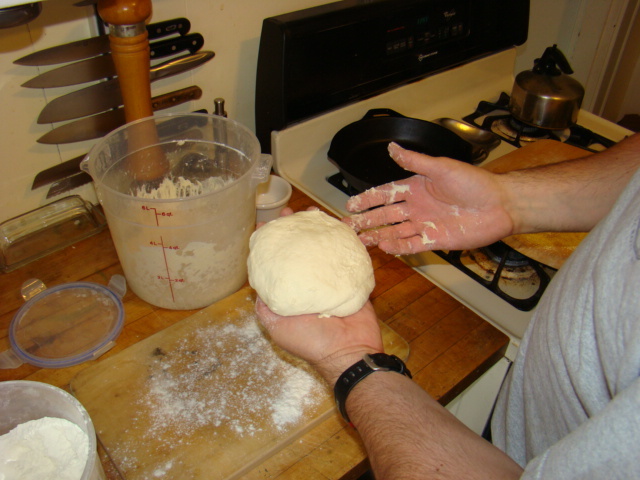 the more character and sough-dough attributes it takes on. 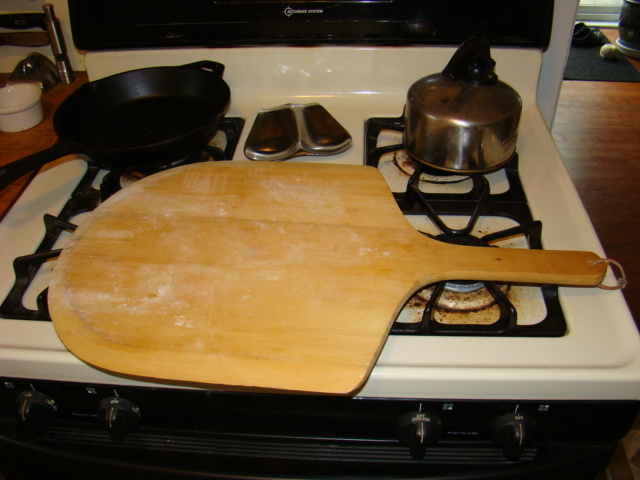 Unlike the requirement for a heavy pot with a lid, this method needs a pizza stone and peel – though the back of a cookie sheet could be used in a pinch for getting a loaf into the oven, and a broiler pan for water. This is crucial for a crisp crust. Let’s make the basic recipe. 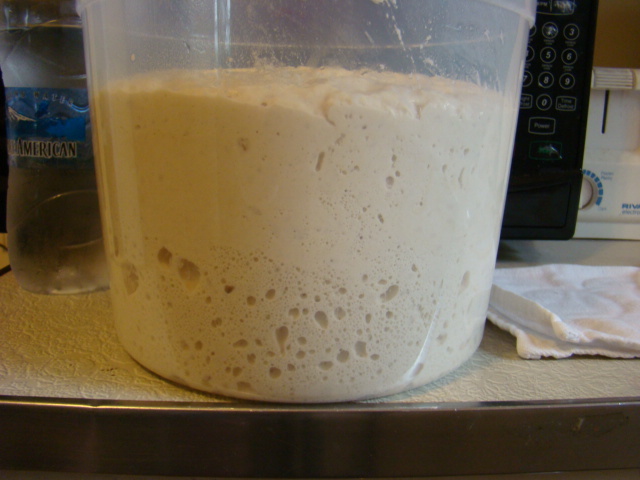 Put warm water into container, add yeast and salt. Add flour and stir till no longer dry. Now the easy part, put a lid on it (not airtight) and let it sit on the counter for a couple (2) hours. 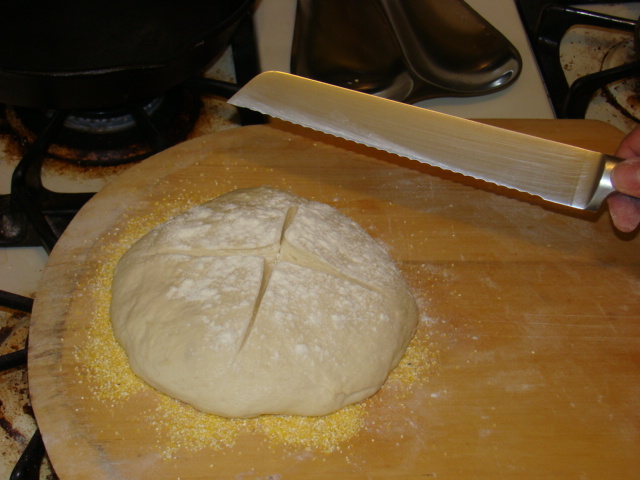 You can use a portion of the dough at any time after this point. Look how much it has risen and the nice bubble activity from the yeast. For now we put it in the fridge. 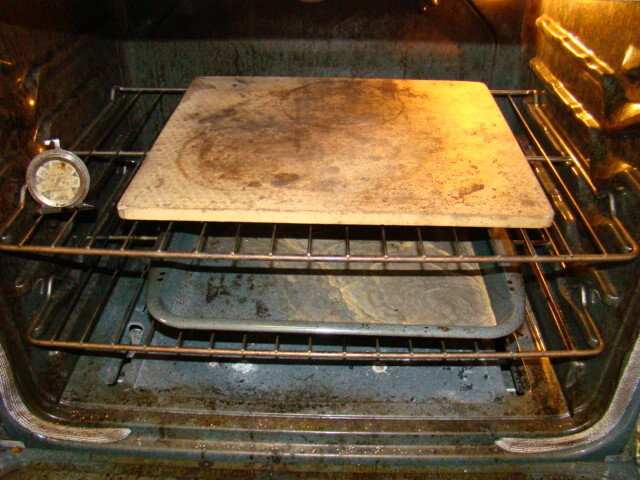 Put the baking stone and broiler pan in the oven. 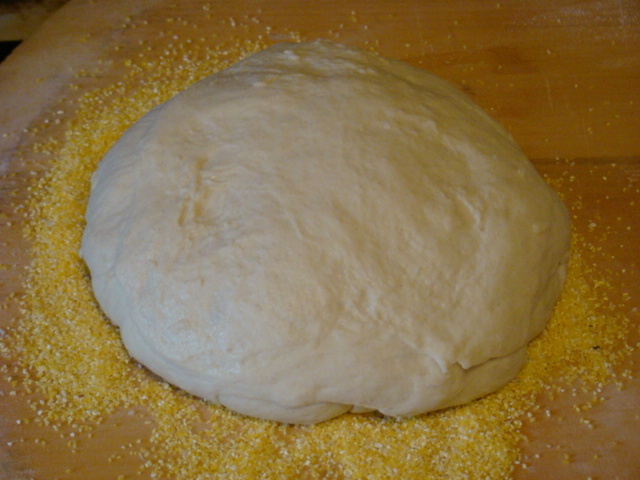 Add some corn meal to the peel to allow the loaf to slide off. 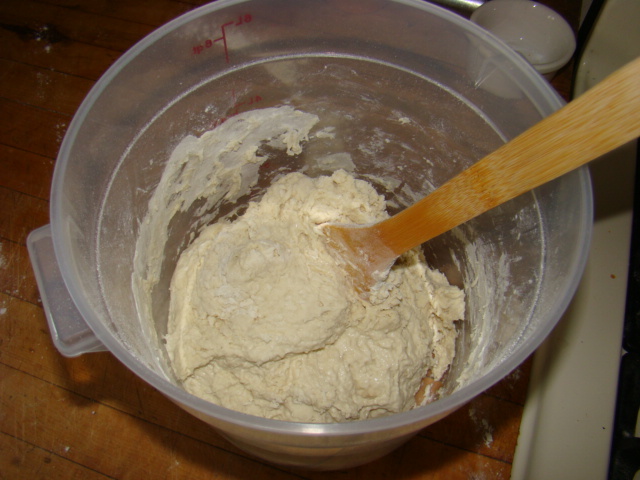 Sprinkle the surface of the dough in the bucket with a little flour. Grab about a grapefruit size piece of dough. Sprinkle a little flour on dough you’ve removed and turn the dough moving the top to the bottom as you go until you have a smooth surface. 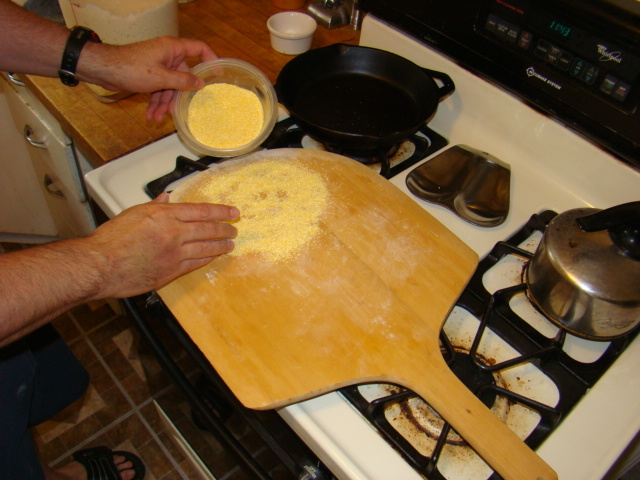 Put the dough on the cornmeal “lubricated” peel. Set the timer for 20 minutes. The bread will rest for 40 minutes, but 20 minutes from baking we’ll preheat the oven (with the stone and the pan inside) to 450F. As I said this will not make a large loaf but it is good for up to 4 people for dinner. Just before baking sprinkle a little flour on top of the dough ball and slash with a serrated knife. The flour keeps the knife from sticking. The authors call this “Dust and Slash.” Catchy, huh? At baking time run a cup hot water into a measuring cup. Slide the loaf onto the stone and quickly add the hot water to the pan. This is the secret to a crunchy crust. Bake for 30 minutes and this is what you get. Let this cool, slice, and eat! Until next time Eat Well & Keep Digging! >I love this method! My favorite recipe is the one for European Peasant Bread. I substitute Spelt flour for the rye. >The peasant bread is on the list! Thanks for stopping by! >Love this bread and book! The only problem is that my family expects fresh baked bread whenever they show up including my four year old grandson. >Catherine, It is wonderful!as long as you have a warning, it can't get any easier!